Magnificent contemporary villa in La Zagaleta! Fantastic newly-built contemporary villa in La Zagaleta! 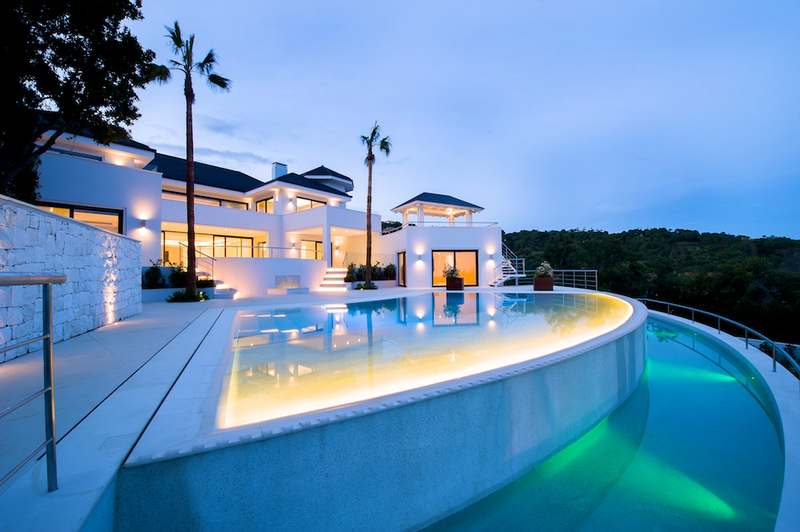 One of the most beautiful modern villas in the most of exclusive luxury development of Marbella. This contemporary property offers bright, open-plan rooms and open views across the private La Zagaleta golf course. Distributed over three levels, the property is entered by a beautiful, large courtyard, adding a touch of traditional grandeur to the villa. The entrance level comprises a bright living room with open fireplace, large modern kitchen, separate dining room, one double bedroom and an office which could also be used as a guest bedroom. Living room, kitchen and dining room are connected by sliding doors. The upper level contains two more double bedrooms, both with bathrooms en-suite, and the spacious master suite with fire place, dressing room and master bathroom. The lower level contains another bedroom, a large room that could be used as home cinema, a bodega and a fully-equipped gym, sauna, Turkish bath and large indoor pool. Underground garage for approx. 6 cars. The villa is fitted with under floor heating throughout and all heating systems are powered by solar panels, making it very energy efficient. Further features include a lagoon-style heated outdoor pool and large terraces with barbecue area. Due to its straight South orientation, the villa enjoys a maximum of light. This is a unique opportunity to acquire a beautiful, contemporary property in La Zagaleta at a very competitive price! Distributed over three levels, the property is entered by a beautiful, large courtyard, adding a touch of traditional grandeur to the villa. The entrance level comprises a bright living room with open fireplace, large modern kitchen, separate dining room, one double bedroom and an office which could also be used as a guest bedroom. Living room, kitchen and dining room are connected by sliding doors. The upper level contains two more double bedrooms, both with bathrooms en-suite, and the spacious master suite with fire place, dressing room and master bathroom. The lower level contains another bedroom, a large room with pre-installation for a home cinema, a bodega and a fully-equipped gym, sauna, Turkish bath and large indoor pool. The villa is fitted with under floor heating throughout and all heating systems are powered by solar panels, making it very energy efficient. Further features include a lagoon-style heated outdoor pool and large terraces with barbecue area. Due to its straight South orientation, the villa enjoys a maximum of light. This is a unique opportunity to acquire a beautiful, contemporary property in La Zagaleta at a very competitive price! Please, send me more information about ref W-020L2O, Villa in La Zagaleta, Benahavis or similar properties.